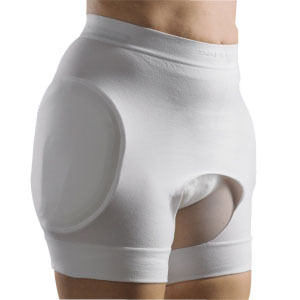 SafeHip® AirX™ is a 100% textile hip protector with a protector shield based on AirX™ spacer fabric technology, which is a breathable, skin friendly and soft textile material. The AirX™ technology is your guarantee for optimal compliance. For hospitals, nursing homes or at home. Designed to be worn underneath an adult diaper. Ideal for individuals suffering from dementia, dizziness or reduced physical strength. Sewn-in shields for optimal protection.